Tandem Social and the Spanish NGO Acción contra el Hambre help you to consolidate your business plan. 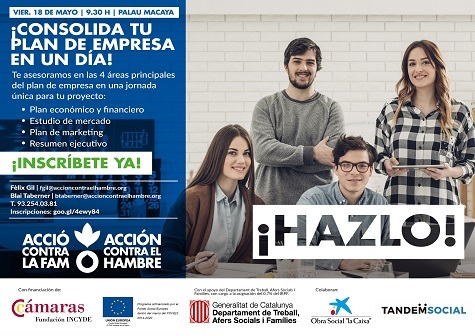 Next Friday, May 18, Tandem Social will be at the Palau Macaya, Barcelona, advising young entrepreneurs about the 4 key areas of a business plan: market research, marketing plan and digital marketing, economic plan and executive summary. If you have a project and would like to receive a boost from experts in social and environmental strategic consulting, sing up: goo.gl/4ewy84.